Whenever my family hosted a get-together and potluck, I was always told to bring the paper plates or cups. Maybe the drinks. But under no circumstances was I ever allowed to actually cook anything for my family. I don’t know if it was because I was the last one to remain single and they assumed I didn’t know how to cook or if they took exception to my messy kitchen and assumed my food would kill them. They were probably right on both counts. Then I got married to a man whose mother is one of God’s greatest gifts to the culinary arts. This woman is incapable of making anything that tastes bad. When she cooks, something as simple as toast can bring on moans of ecstasy; even the forks taste good at her house. When I married her son, she gave me a box of hand-written recipe cards with all of the family recipes. And by “family recipes,” I mean recipes from her mother, grandmother, sisters and aunts – people who create the same kind of magic in the kitchen. It took me a few years to realize what a treasure that little box was, but it eventually became one of my most valued possessions. In fact, during the divorce, my ex-husband and I argued more over custody of that box than custody of our children. I used her dessert recipes more than any others. Grandma Tice’s Sugar Cookies. 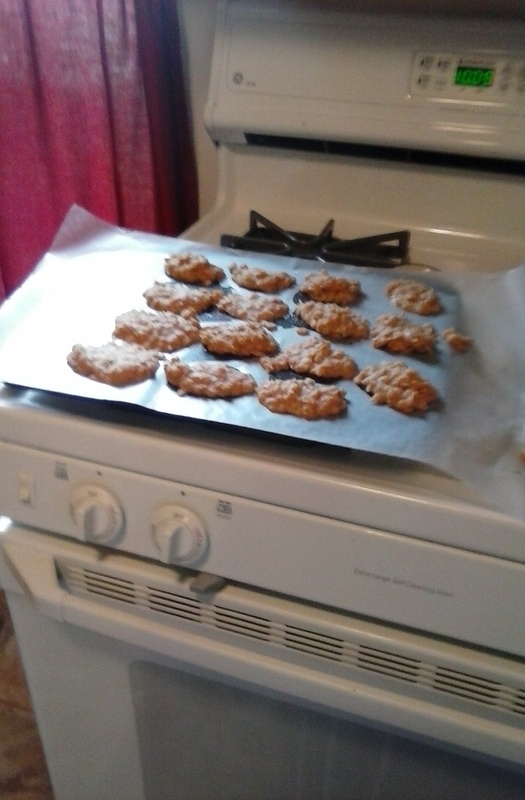 Aunt Neva’s Peanut Butter Cookies. Quagmire Bars. Grandma Goodwin’s Applesauce Chocolate Chip Cookies. The No-Bakes became my specialty during the summer of 2011, when I was pretty well immobilized in a brace after breaking my neck in a car accident. I couldn’t do anything by myself, but the one thing I truly missed was being able to bake goodies for my family. I couldn’t bend over the oven or lift the cookie sheets, so my family ended up eating store-bought cookies. Which is simply not done around here, so I became the queen of the peanut-butter no-bakes. Batch after batch after batch. I made them for my family. I made them as thank-you gifts for the people who helped us after the accident. I made them at least once a week, sometimes more. And a strange thing happened. People started requesting my no-bakes. I don’t know why. No-bake cookies are no-bake cookies. A simple recipe, easy to duplicate. And yet somehow, mine earn praise when I least expect it. And I don’t know why. I haven’t tampered with my mother-in-law’s recipe. Good Lord, that would be like trying to edit “Huck Finn” or improve upon the Mona Lisa. No, one does not tweak perfection. When a local boy graduated from high school and went on a Mission trip with the church, he told everyone all he wanted was one batch of my cookies to take with him. When a friend sponsored a blood drive in honor of her late father, she asked if I would provide a batch of no-bakes for the event. When parents are asked to bring a dish to pass at different events, I am rarely given a chance to choose what to bring. It’s a given that I will bring my no-bakes. And now, if you’ll excuse me, I have a T-ball awards party this afternoon, and I have cookies to make. Heat butter, milk and sugar over medium heat until it reaches a full rolling boil. Let it boil for 90 seconds. Less time leaves them gooey, more will make them crumbly. Remove from heat. Stir in oatmeal until thoroughly mixed. Add peanut butter and vanilla. Mix well, and drop spoonfulls on waxed paper. Here are my “tricks” when it comes to these cookies: Always use cheap peanut butter (I don’t know why, but that’s what MIL says, and I always obey). Use butter, not margarine. Last but not least, if you make a double batch, use the whole 18 oz jar. Trust me on this one. So where is the recipe? This might actually be something I could accomplish. I use to bake and love the process. I can’t any longer for many reasons. But no bake cookies? I think I could do this. I understand the speaking with food though, I loved this one. Just added the recipe, as you requested, Ma’am! But that means you have to come back and let me know how they turn out. You can also add 1/2 tsp cocoa to the first three ingedients to make them chocolate, but my chocolate ones never turn out quite as well. The most important step is to make sure you let them stay at the boiling stage for the full 90 seconds. You are so lucky! My ex’s aunt is a phenom cook but she does it by the “little of this, little of that” method. It varies each time and is delicious each time. So, I could never replicate her cooking! Luckily, I turned out to have a bit of creative talent in that dept on my own. But nothing like your no-bake cookies:). My MIL does a lot if the “little of this, little of this” cooking too, which explains why my cooking never tastes exactly like hers! My ex-husband did it that way too — his macaroni salad is food fit for a God, but I’ll be darned if I can figure out how he did it. I have the recipe, I watched him make it, but mine doesn’t even come close.